The United Nations University research and training programme area entitled "Sustaining Global Life-Support Systems" responds to the priorities identified in the UN system-wide Agenda 21 emanating from the United Nations Conference on Environment and Development (UNCED). The University's work has been organized according to five complementary programmes: (i) Eco-restructuring for Sustainable Development; (ii) Integrated Studies of Ecosystems; (iii) Information Systems for Environmental Management; (iv) Natural Resources in Africa; and (v) Environmental Law and Governance. UNU research is multidisciplinary, encompassing both natural and social science approaches. The present book falls within the second programme, Integrated Studies of Ecosystems. This programme aggregates issues of environmentally sustainable development from the entry point of ecosystems and their ability to support, resist, or recuperate from the long-term impacts of major transformations. The programme has two main thrusts, one focusing on integrated studies of fragile ecosystems and vulnerable places in given geographical zones; the other focusing on critical resources and their management. 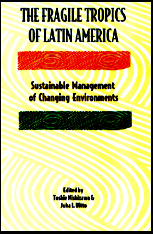 The research carried out for this volume was initiated under an earlier UNU programme on Sustainable Development in the Humid Tropics. The first step for the research, the outcome of which is the present book, was the symposium on the Fragile Tropics of Latin America: Changing Environments and Their Sustainable Management, organized in Tsukuba, Japan, 1990. The work forms a part of a larger UNU effort to understand the man-environment relationships in the humid tropical areas of Asia, Africa, and Latin America.